Emotions can get the best of us sometimes. No matter how old or mature we think we are, emotions have a strong pull and can make us explode with anger or jump for joy at the most seemingly random moments. They are a tricky thing to control but rest assured that they are working hard to keep you balanced - if we’ll let them do their jobs, that is! Even though emotions can get the best of us sometimes, let's be honest. Some emotions are just more fun than others. Sadness is too gloomy. Anger and Disgust need to chill out, and Fear, well, that guy is kind of a mess. This Deluxe Adult Inside Out Joy Costume turns you into the funnest emotion out there and it comes straight from the Disney Pixar movie! 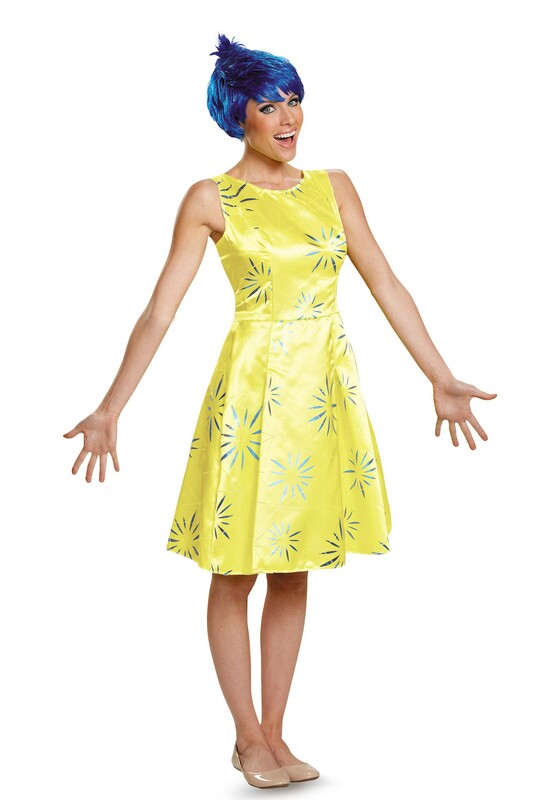 This officially licensed Inside Out Joy costume comes with all of the details you need to bring a smile to everyone’s face this Halloween! The dress is made of 100% polyester satin fabric with metallic print details. It is a sleeveless sheath dress that fastens in the back with Velcro for a comfortable fit for all night wear. You can’t very well spread joy to those around you if you aren’t feeling comfortable in your dress! The costume also includes a wig in Joy’s signature style. It is made of synthetic hair with metallic strands and is on a mesh cap with an elastic edge for a secure and comfortable fit.